Don't miss your chance to visit this astonishing shipwreck before the museum closes for a major overhaul. This summer will be the last chance to see the Mary Rose, the early 16th-century wooden warship miraculously salvaged by underwater archaeologists in the Solent in the 1980s, before the ship's current display closes for several years for an ambitious redesign. When it opens, this will be – from the looks of the model – a museum truly worthy of one of the most amazing historic finds of the 20th century. Here, you'll be able to look across from the ship in its sealed conservation chamber to facing displays of the unique objects that were preserved in it – from medical equipment to what looks like Lord Flashheart's boots. 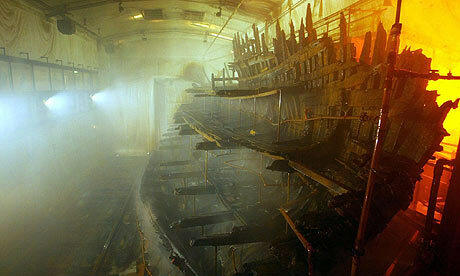 The Mary Rose is a Renaissance Pompeii – a window on a lost way of life. But where Pompeii was a minor Roman city, this ship was one of the pearls of Henry VIII's navy, and one of the first purpose-built battleships in history. That's why, when it mysteriously capsized and sank, it was so crammed with gear. What makes it moving is what makes Pompeii moving – the astonishingly detailed survival of everyday artefacts. You can see, in the current museum of finds near the boat shed in Portsmouth's historic dockyard, big cauldrons in which meals were cooked below decks, a brass syringe from the barber surgeon's cabin, strange wooden carvings that sailors made to pass the time.